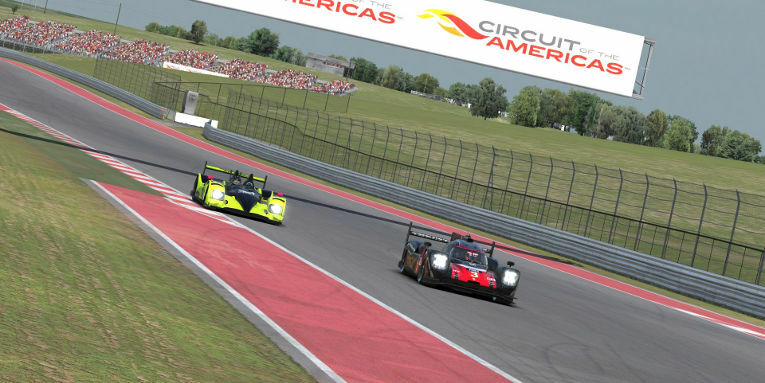 One of the most technical tracks on the NEO Endurance Series calendar allowed the top teams to separate themselves, but it also caused some COTA carnage in the second round of the season. The six-hour race at Circuit of the Americas began with two hours of trouble, including a lap-one, turn-one incident in the P1 field triggered by the AVA Vervatic #23 car. That damaged front-runners including Thrustmaster Mivano Racing’s #4 entry and the fifth-place qualifiers from Wyvern Racing. Numerous other incidents in traffic resulted in 11 penalties issued within the first third of the race. Once the contact cooled down, managing off-tracks became the name of the game. Fifty teams were warned for exceeding track limits, and four received drive-through penalties for it. A line of traffic races up the frontstretch. Leading the teams that survived the incident- and penalty-filled race unscathed were Thrustmaster Mivano Racing’s #3 Porsche 919 Hybrid. 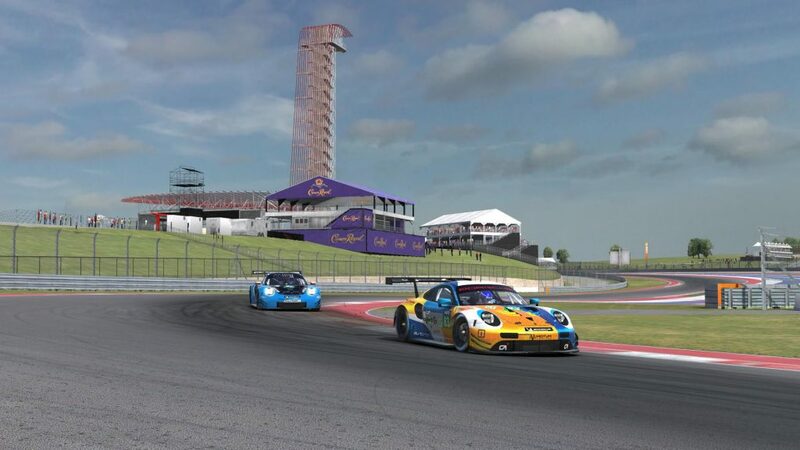 After Tommaso Carlà took the pole position in the final seconds of qualifying, he and teammate Marcus Hamilton were unbeatable in the race, backing up their Sebring win with another one at COTA. More than one minute behind at the finish was Porsche Basel by Sorg Rennsport eSports, which passed third-place SimRC.de with just over two hours to go and pulled away to seal their best NEO result to date. 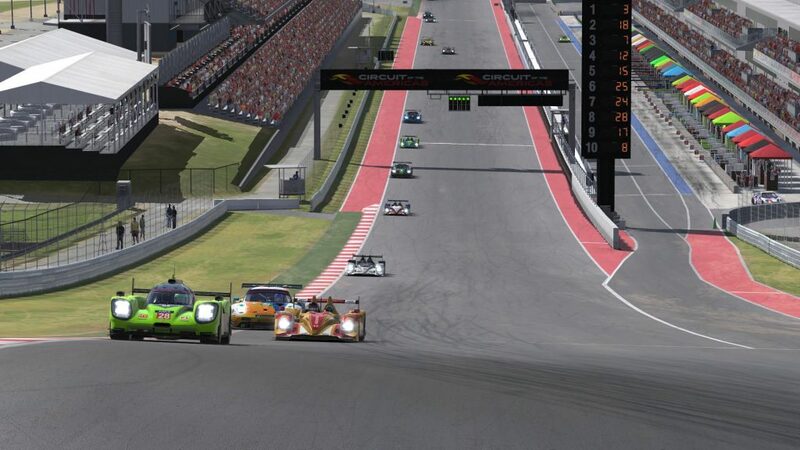 The P2 field also saw a familiar face up front, as the Sebring-winning #39 team of AVA Vervatic put together a nearly perfect race to top runner-up Apex Racing UK. The podium-contending Race Clutch car crashed in the final hour, elevating Torque Freak Racing into third position. Altus Esports leads TRITON Racing late in the event. Despite being in their first NEO season, Altus Esports wasted little time getting to the top of the leaderboard. Andrew Kahl made a race-winning pass on the polesitters from TRITON Racing after the penultimate pit stop and survived a late charge from TRITON’s Kamil Franczak to secure the GT class victory. TRITON took second and MSI eSports finished third, while the Sebring winners from CoRe SimRacing couldn’t recreate their round-one magic and finished a distant twelfth. Stay tuned to neo-endurance.com in the coming weeks for full recaps from each class and analysis from the teams involved.